Without question, by sheer volume of lines Moneypenny is EON’s least developed character. We know next to nothing about her except that she is M’s secretary and knows how to use a desk. Like so many other testosterone fueled dystopias, Moneypenny is little more than window dressing for much of the James Bond Universe. Dynamite has been trying to change that. While Naomie Harris does the best she can with what little she’s given and The Moneypenny Diaries works hard to retcon a story, Dynamite’s James Bond comics are where we get the most interesting, meaningful looks into Moneypenny as a person. 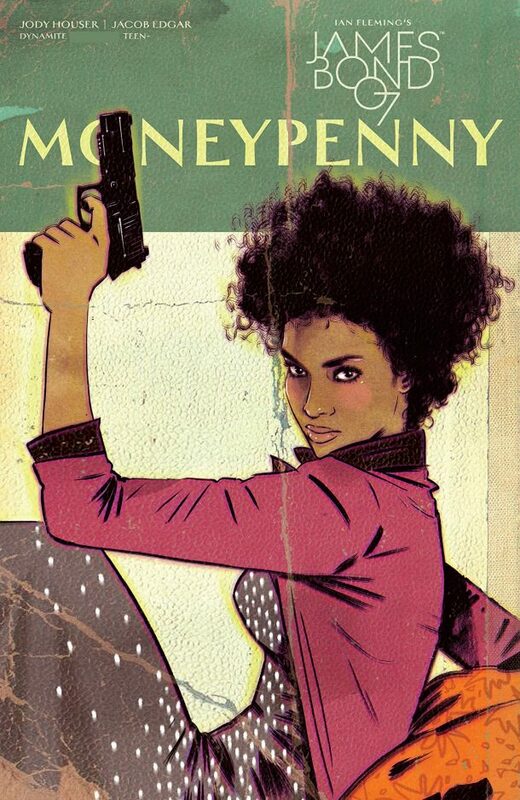 Jody Houser brings a different kind of wit and flair to Moneypenny in James Bond: Moneypenny. And while the title leaves something to be desired, it’s a book worth paying attention to. Artist Jacob Edgar sticks close to what we’ve seen in other Bond books with stark colors and clean lines but it’s Houser’s sharp, cutting writing that makes it worth staying for. However, perhaps the most brilliant addition in the Moneypenny one-shot is the inclusion of “Moneypenny Vision.” While words are often used to give peeks into Bond’s subjectivity, this time we get to literally see how Moneypenny sees the world. The colors change, threats and people are highlighted. This is her mind’s eye, the one she always has activated, watching and waiting. This is the lens through which we see her very dangerous world. unshakeable. With danger as one’s watchword it’s easy to see how a young woman with pigtails would go one to be the stone cold killer who acts as gatekeeper to Britain’s spymaster. While it’s not the full character exploration that Moneypenny deserves it does more than nearly anyone else has bothered to do. 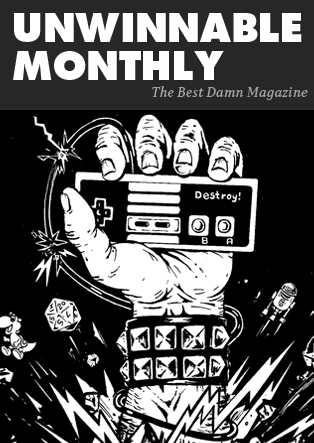 With its loose, almost 1980s feel Dynamite’s Moneypenny one-shot is worth your time if only to round out one of spy fiction’s most grievously overlooked characters. Monday was Jack Kirby’s 100th birthday. Marvel is currently publishing one dollar True Believers reprints of some classic Jack Kirby comics to celebrate the King’s centennial. I picked up two Kirby Thor comics a few weeks ago and I’ve been meaning to check in on my favorite thunder god since then. Generations: The Thunder seemed like just the right new Thor comic for me. I fell behind on a lot of Marvel books around Original Sin and checked back in with Secret Wars. I would check in here and there but Thor is the Marvel Comic I’ve missed the most. I loved the switch to Jane Foster wielding Mjolnir and I’ve been meaning to sit down and read through her adventures on Marvel Unlimited. 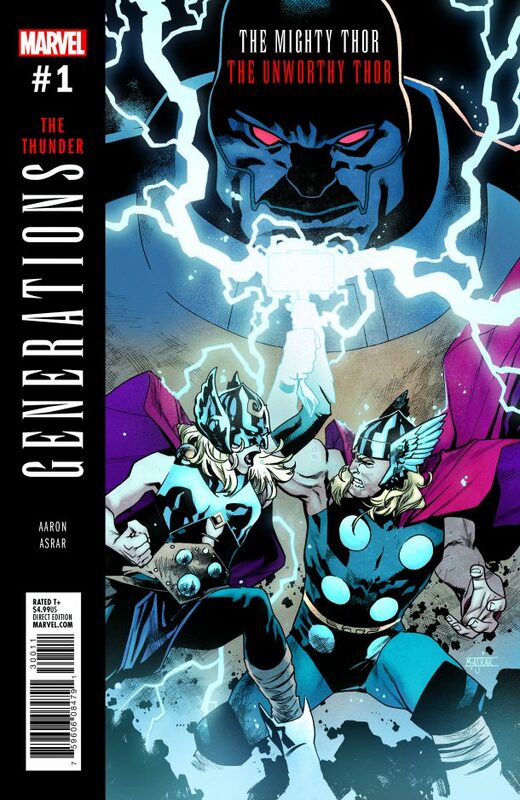 Generations: The Thunder is the perfect re-entry point for a lapsed Thor reader. I went into Generations: The Thunder with a basic understanding of Thor’s status quo but I haven’t read anything since the Malekith story right after the Godbutcher Saga. This comic begins with a young Odinson (currently known as the Unworthy Thor) trying to lift Mjolnir and failing. He’s not worthy yet. Odin calls him to a feast in Asgard’s great hall and demands the young deity dress in his formal wear (AKA Kirby’s original Thor costume). The whole Norse pantheon is there and the servants are under orders not to give Thor any mead. Naturally, as soon as Thor hears a Viking prayer, he slips out of what he feels is a boring social event and flies his magic goat to Midgard (yes, Thor rides a magic goat and it is magnificent). The Odinson arrives, greets his worshippers and joins the battle. The Vikings are in Ancient Egypt battling the X-Men villain, Apocalypse, and his followers. The current Thor, Jane Foster, finds herself pulled into the past in the middle of ancient history. After some of young Thor’s casual sexism (he is baffled that a “wench” can hold his hammer), the two join forces to smite Apocalypse. The Thors fight alongside Vikings. Odinson, the literal answer to the Vikings’ prayers, rides in on his goat, cleaving through ancient Apocalypse’s Egyptian death cult while Jane Foster’s Mighty Thor smashes Apocalypse in the face with her big ol’ hammer! The battle is a lot of fun. Aaron and Asrar channel Kirby and Walt Simonson all over the place with some damn dynamic panel layouts. However, the meat of the story centers on humanity and its impact on godhood. Jane Foster is battling cancer and she gets more sick every time she wields the hammer. But while she wields Mjolnir, she is an immortal thunder god. The temptation weighs on Jane as she battles the nigh immortal mutant and observes young Thor relish in his godhood amongst the Vikings. Jane Foster cherishes her humanity and the longer she stays in her Thor form, the further away from humanity she gets. Young Thor is immortal and flaunts his power for show among the humans. He feels himself to be above them, but Jane sees that the time he spends among mortals will make him the Thor she will eventually meet. Odinson doesn’t know Jane yet and Jane doesn’t know this Thor, but they have a good rapport. Generations: The Thunder is up there with the Wolverine/All New Wolverine jam, Generations: The Best. Both books resonate on a more human level than some of the other Generations books. Jason Aaron and Mahmud Asrar take full advantage of the one issue format. There’s big action, fun characters, a tinge of melodrama and style to spare. Jack “King” Kirby would be proud.